Rinse the apricots well in cold water then place in a bowl. Pour over enough boiling water from the kettle to barely cover them. Leave to soak while you heat 1 tablespoon of oil in a large frying pan over a medium heat. Add the garlic, onion and carrot and sweat for a few minutes until softened. Add all the spices, and fry for a few more minutes. Transfer to a large stockpot. Turn up the heat under the (now empty) frying pan and add the rest of the oil. 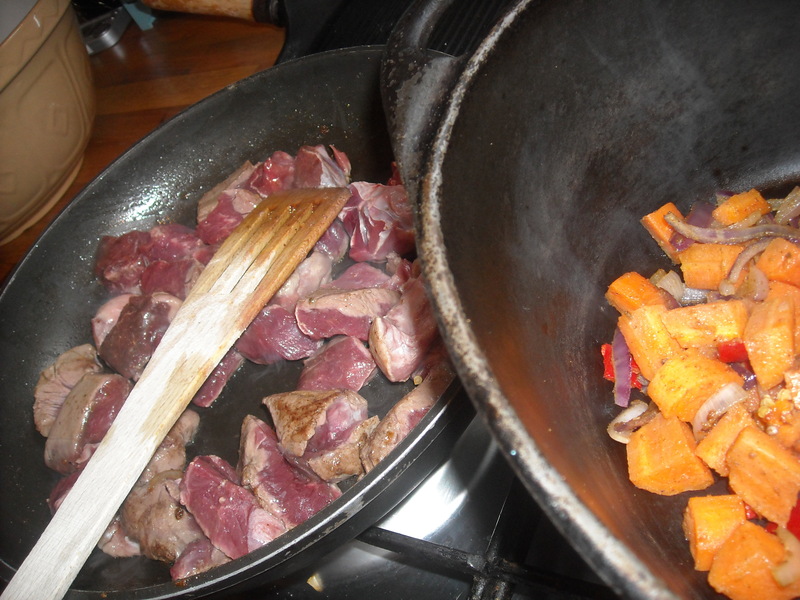 Brown the meat quickly in small batches and add to the vegetables. Pour over the juice from the soaked apricots, the glass of wine, the chutney and enough water to just cover the meat. Bring to the boil, then reduce immediately to a very slow simmer. Put on the lid and cook for 1½ hours. Add the apricots. and cook for a further ½ hour at least but longer won’t hurt it. By this time the meat should be extremely tender. Taste a bit and if in doubt cook for a little longer. While this simmered away we made our dinner. Quantities here are variable, depends what you have and what you fancy. 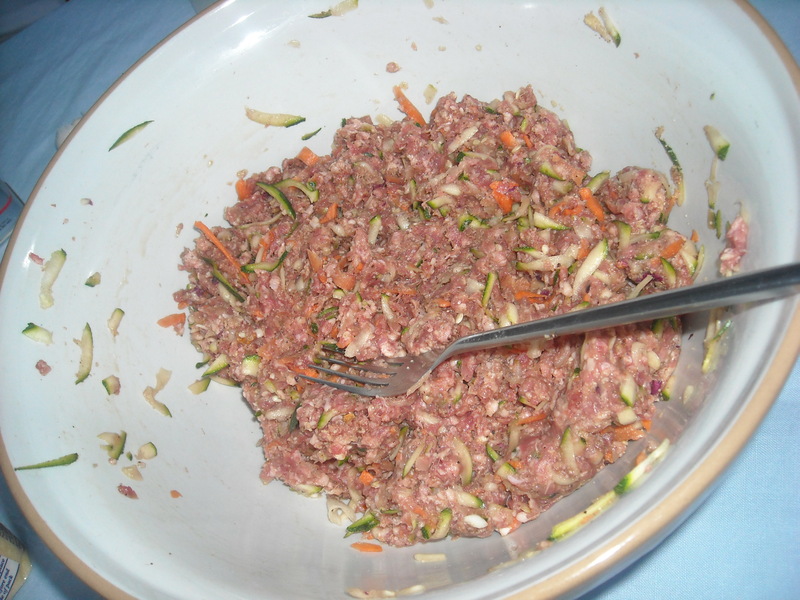 We put in about 500g lamb mince (again from Mill Farm), 1 egg, 1 grated onion, 1 grated courgette, 1 grated carrot, a couple of crushed garlic cloves and a good big tablespoon of the Moroccan spice blend Ras-el-Hanout. Ours is from Seasoned Pioneers – it’s a complex mix of spices and herbs and contains REAL rose petals. Nice. Mix it all together in a big bowl and sprinkle some semolina in until the mixture starts to stick together. A bunch of herbs – we used coriander but you could use basil, parsley, thyme…depends what you’ll be eating it with. Blend yeast with flour then add salt. Make a well in the middle and add oil. Start to mix the flour into the well and slowly pour in the milk. Knead on a floured board for approximately 10 minutes then put in a warm place for an hour. Rip up your herbs and add to the dough. Depending on the size you want your bread to be, divide it up into 8 – 16 balls and roll out until about half a centimetre thick. Cook on a hot griddle pan for 2 minutes either side. 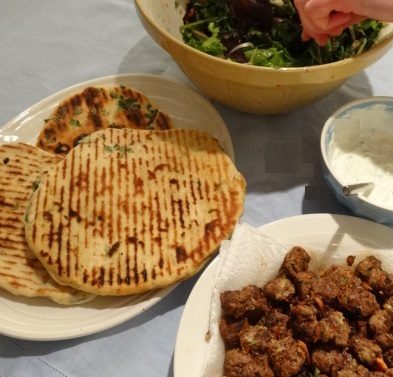 This is our favourite Culinari combo so far – just a perfect spring supper, lots of fresh flavours and it all works so well together – the soft bread, the fragrant lamb and the zingyness of the salad and yogurt. All in all deliciousness. We drank… Cucumber & Mint G&Ts – don’t know if Martha Stewart would approve of our doubling the Gin quantities in her cocktail recipe but there you go. It’s a delicious twist on G&T when it’s too early in the year for a Pimms. 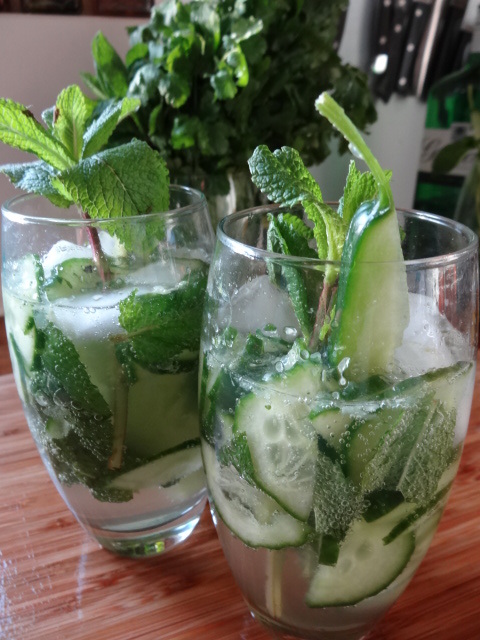 Muddle some mint and cucumber in the bottom of tall glasses, fill the glass with ice then add gin and tonic and garnish with a mint sprig and a cucumber wedge. We talked about… David Bowie at the V&A, Weydon Student Leaders and school uniform, Thatcher, holidays, GCSEs, Proms, false eyelashes. This entry was posted in bread, lamb and tagged bread, cocktails, Farnham, flatbread, food, La Culinari, lamb, Mill Farm, mutton, salad, spicey. Bookmark the permalink.